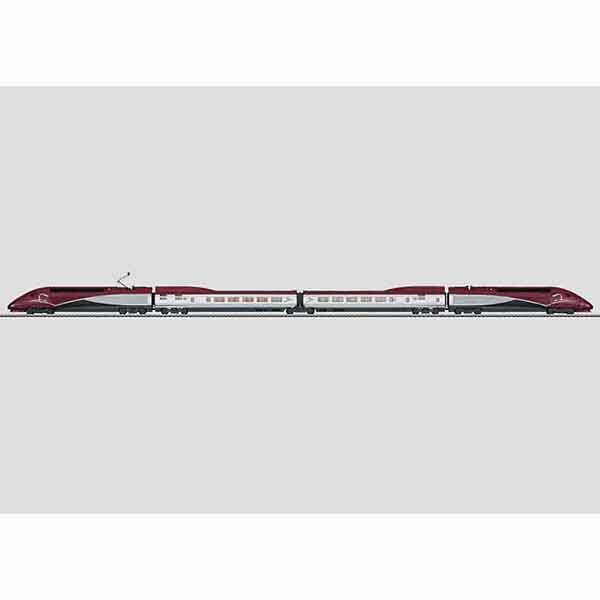 Prototype: High speed train painted and lettered for the THALYS PBKA of Thalys International, Brussels, Belgium in the multi-system version for service between Paris, Brussels, Cologne, and Amsterdam. 2 powered end cars (TK1 and TK2), 1 transition car (R1), 1st/2nd class, 1 transition car (R8), 2nd class. The newest paint scheme. The train looks as it currently does in real life in 2010. Must buy 3 car sets 43421, 43431 and 43441. Not sold alone nor with less than 3 car set. Buy placing an order for the 37791 alone, automatically we will add the set of cars. Model: The train is a 4-part set. Both end cars (TK1 and TK2) are powered. The train has an mfx digital decoder and extensive sound functions. It has controlled, high-efficiency propulsion in both powered end cars, centrally mounted. 4 axles powered through cardan shafts in each end car. Traction tires. The train has factory-installed interior lighting. The triple headlights and dual red marker lights change over with the direction of travel. They and the interior lighting will work in conventional operation and can be controlled digitally. The third headlight for the French headlight code can be turned off separately in digital operation. 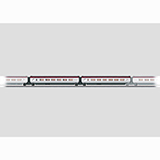 The headlights and interior lighting are maintenance-free, warm white LEDs and the marker lights are maintenance-free red LEDs. The train has separately applied metal grab irons. It also has inset windshield wipers. The engineer's cabs in the powered end cars have interior details. A powered end car and a transition car are permanently coupled together in pairs and have special close couplings with a guide mechanism. There is an additional guide mechanism in the Jakobs truck. The end cars have a pickup shoe changeover feature so that the pickup shoe at the front of the train is the one picking up power. The interior lighting is powered through a continuous electrical connection through the entire train. Each powered end car has 2 SNCF design single-arm pantographs. The pantographs work mechanically but are not wired to take power. The train is a scale reproduction. The minimum radius for operation is therefore 360 mm / 14-3/16, when there is sufficient clearance on both sides. Length of the 4-part set 101 cm / 39-3/4. Warm white LEDs for lighting. The 37791 basic set can be expanded with the 43421, 43431, and 43441 extension sets to a prototypical 10-car unit. This model can be found in a DC version in the Trix H0 assortment under item no. 22371. Prototype: High speed train painted and lettered for the THALYS PBKA of Thalys International, Brussels, Belgium in the multi-system version for service between Paris, Brussels, Cologne, and Amsterdam. 1 intermediate car (R2), 1st class, and 1 intermediate car (R3), 1st class. The newest paint scheme. The cars look as they currently do in real life in 2010. Prototype: High speed train painted and lettered for the THALYS PBKA of Thalys International, Brussels, Belgium in the multi-system version for service between Paris, Brussels, Cologne, and Amsterdam. 1 intermediate car (R6), 2nd class, and 1 intermediate car (R7), 2nd class. The newest paint scheme. The cars look as they currently do in real life in 2010. Prototype: High speed train painted and lettered for the THALYS PBKA of Thalys International, Brussels, Belgium in the multi-system version for service between Paris, Brussels, Cologne, and Amsterdam. 1 intermediate car (R4), bar car 2nd class, and 1 intermediate car (R5), 2nd class. The newest paint scheme. The cars look as they currently do in real life in 2010.